Fighting to be Frugal: Staying Warm While Not Going Broke -it can be done! Staying Warm While Not Going Broke -it can be done! Everyone wants to save a dollar or two. One of the best ways to save money during the winter would be to save money on heating. I can see you nodding. In our home we have electric heat as a back up source here. 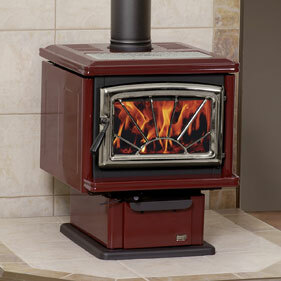 It's always set at the absolute lowest setting and has yet to kick in as we have a wonderful wood stove. Our monthly heating bill, prorated over the year, is $48. It's that low for two main reasons, one I am home in the day to keep "the home fires burning" (couldn't resist), and secondly because we have a Pacific Energy Woodstove. I highly recommend this brand if you are looking for a stove. This is similar to our stove. However, if you aren't home all day, here are a few more heating tips that may help you out. -On a frosty morning, before the sun gets warm enough to burn the frost off, head outside for a look at your roof. While standing on the lawn, take a look up at your roof and see if you can find any spots that are melting away now. Those are your heat loss areas and they need your first attention. See about adding extra insulation there or what other measures can be taken to keep your heat inside the house. -Check the caulking and weatherstripping around your doors and windows. All those little permeations can let out a lot of heat. By redoing those, you can cut down on your heating bill substantially. -Open your windows. Yes, you read that correctly. Opening your windows, or your air exchanger on full, for a few moments each morning allows fresh air in to your home. It's much cheaper to heat fresh air instead of stale air. -Close the bedroom doors and heat just the main area. -If you have an upstairs, think about covering your stairwell opening with a blanket to keep the heat downstairs. -Set your thermostat back when you leave the home or go to bed. Your home doesn't need to have those balmy temperatures while you are out at work or wherever, nor while you are sleeping. A person sleeps better in a cooler environment. If you're chilled, just add an extra blanket to your bed. Every degree you turn your thermostat down will save you 1% or more on your heating bill for the year. May not sound like much at first, but knocking 10% of your bill surely could come in handy. -Get a programmable thermostat to help you remember to change the heat in the day and night. -Wear a sweater and slippers in your home. By doing so, your thermometer can be set lower, and you will still be warm. -Add a plastic covering to windows that are very leaky. -Open the stove when you are finished cooking and baking and allow the heat you've already paid for to warm up the rest of the home (keep in mind to be safe around little children). -Drink a warm beverage or some soup. Warming up on the inside helps the outside of you to regulate temperatures. -Close the curtains when it's dark to keep the heat in. Open them in the day to take advantage of the solar heat from your windows. -And last, but certainly not least, is body heat. Snuggle up to stay warm during those cold months! Roughly how much does it cost you a year for wood? I used oil the last two years, and it's was about $2500/year. This year I'm stuck with electric.